While government budgets continue to flatten, there continues to be an increasing need for military bandwidth and protected tactical communication—these being essential for support of military and humanitarian missions. For example, recent estimates state that the U.S. government’s demand for military satellite bandwidth is expected to rise 74 percent over the next decade from the current level of 24 gigabits per second to more than 41 gigabits per second, according to a Northern Sky Research study that was published in 2013. To fulfill these needs, governments should look at non-traditional methods to augment their existing assets. An affordable MILSATCOM architecture should include core assets, or dedicated government satellites and augmentat ion assets, such as hosted payloads and single mission free flyers. In addition to traditional communication, there is the need to provide protected communication due to emerging threats in a highly contested environment where signal jamming prevention is imperative. This layered architecture is an effective and practical approach to satisfy emerging MILSATCOM mission needs. To fulfill these needs, governments should look at non-traditional methods to augment their existing assets. 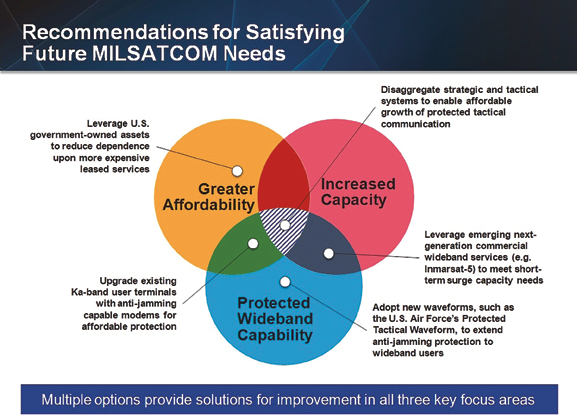 An affordable MILSATCOM architecture should include core assets, or dedicated government satellites and augmentation assets, such as hosted payloads and single mission free flyers. In addition to traditional communication, there is the need to provide protected communication due to emerging threats in a highly contested environment where signal jamming prevention is imperative. This layered architecture is an effective and practical approach to satisfy emerging MILSATCOM mission needs. Satellite systems, such as the U.S. Air Force’s Wideband Global SATCOM (WGS) system, are vital in providing necessary broadband communications connectivity for U.S. and allied warfighters around the world. To aid in continuing to fund crucial satellite systems like these, governments have found partnering with other nations useful for obtaining quick, reliable MILSATCOM access. A successful example of such an occurrence is the U.S. Department of Defense’s program to bring partner nations into the WGS system as a highly affordable way to gain modern wideband MILSATCOM access globally for a much lower cost than developing a dedicated satellite system. Australia became the first international participant in the WGS system under a cooperative agreement with the U.S. Air Force in 2007. In 2012, five additional partner nations—Canada, Netherlands, Luxembourg, Denmark and New Zealand—executed a similar agreement to gain global access to the WGS system. The U.S. government is currently inviting discussions for international partnerships for the eleventh and twelfth WGS satellites. This arrangement provides the benefits of immediate access through an existing worldwide infrastructure. In addition, international partners are able to leverage existing user terminals and telecom equipment. A layered architecture is an effective and practical approach to satisfy emerging MILSATCOM mission needs. 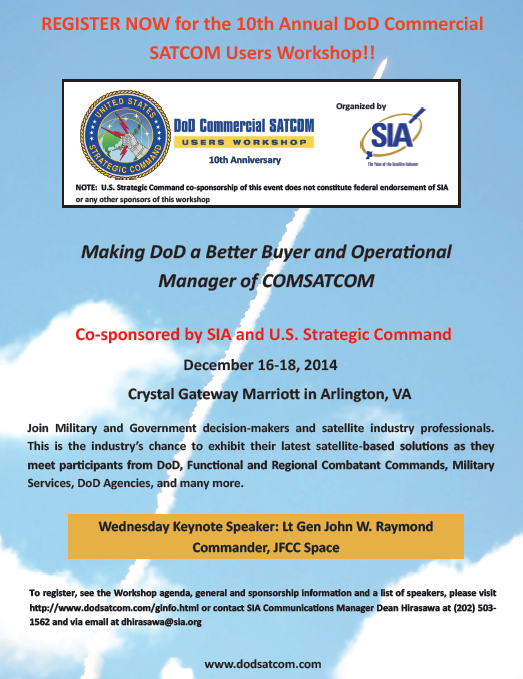 Another solution designed to help alleviate military satellite services shortage is the use of hosted payloads. 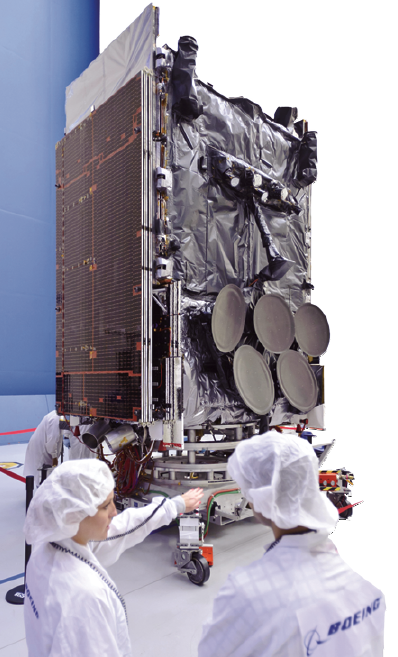 A recent example is the commercially hosted payload on Intelsat 22, which provides the Australian Defence Force (ADF) with much-needed service at less cost. This was implemented in a fraction of the time typically required to deliver a traditional military satellite, saving both money and time. According to the ADF, $150 million was saved by contracting with Intelsat for the hosted payload for 15 years, instead of purchasing and operating a fully dedicated satellite. 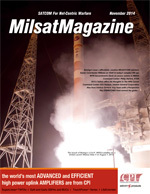 The satellite industry has witnessed increased interest in recent years in hosted payloads—from the formation of a Hosted Payload office at the U.S. Air Force—to the formation of an industry-led Hosted Payload Alliance—to increased media outlets looking to promote hosted payloads as an affordable, and doable, solution. 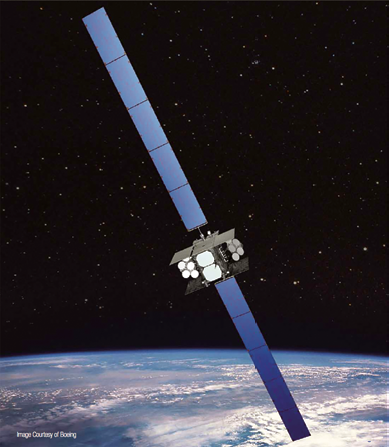 To make it easier to connect governments to commercial satellite systems, organizations such as Boeing Commercial Satellite Services (BCSS) exist to market commercial satellite telecommunications services to the U.S. government and other satellite users. BCSS works with the owners of satellite systems to market available bandwidth on active systems as well as to include hosted payloads on their future spacecraft. These are superb examples of commercial and government industries working together to provide substantial capability economically and in a timely manner. Also illustrated though these examples is how the lines that have been drawn between government and commercial services are now blurring. This attempts to address the continuing shortfall of communication availability seamlessly with U.S. and other government assets and existing ground infrastructure. The U.S. Air Force has already shown interest in using commercially-hosted payloads for government applications, with the recent award of the Hosted Payload Solutions (HoPS) indefinite-delivery-indefinite-quantity contract (IDIQ), which allocates nearly $500 million to provide a faster path to fulfill the U.S. government’s bandwidth need. Many entities are already benefiting from hosted payloads, with more than two dozen hosted payloads having already entered service over the previous 35 years, serving customers ranging from the Coast Guard to the Japanese government to most branches of the U.S. military, as well as many others. In addition to funding traditional satellite systems and investing in hosted payloads, militaries could also benefit by using free flyers—like the recently developed 502 Phoenix small satellite—that perform a unique mission and are not associated with a constellation. These satellites could separately support both strategic and tactical missions. Beyond the basic needs of providing communication in the field, there is a growing need to increase the ability to transmit protected communication in order to prevent threats and inadvertent signal jamming. There has been a great deal of debate about regarding what the best course of action is for protected tactical missions; however, a well-rounded solution should provide affordable, global protected tactical communication using existing assets. The U.S. Air Force is investigating innovative ways to address the jamming threat, while still dealing with the current restrictive budget environment. Boeing is one of a few companies that was contracted to develop and test protected tactical waveform technology. This technology boosts the ability of warfighters to send protected information without enemy data interference by using currently available satellites that do not have anti-jamming technology of their own, showing the ability for the technology to be quickly deployed at a much lower cost than building a new satellite. The company recently applied new anti-jamming technology to both an on-orbit military satellite (WGS-6) and a commercial satellite (ViaSat-1) for the first time, expanding the military’s potential to access secure communication more affordably. These solutions are just some of the options available to governments needing to boost their military bandwidth. Though budgets are decreasing, it is imperative that the military receives the communication capabilities necessary for mission success. Note: Dedicated satellite communications systems, such as the U.S. Department of Defense’s Wideband Global SATCOM satellites, pictured on the first page of this feature, provide vital bandwidth to the U.S. and allied warfighters. All photos in this feature are courtesy of Boeing. John Leuer is the Executive Director for Government Space Systems’ MilSatCom programs, including Wideband Global SATCOM (WGS), Protected Tactical Systems (PTS), Strategic MilSatCom, and the EHF/UHF payload programs. Additionally, Leuer is responsible for Next-Generation Communications, which includes a family of programs and product development efforts centered on Laser Communications.